The shots above are small versions from this site where you can find other great images from Obama’s first 167 days in office. 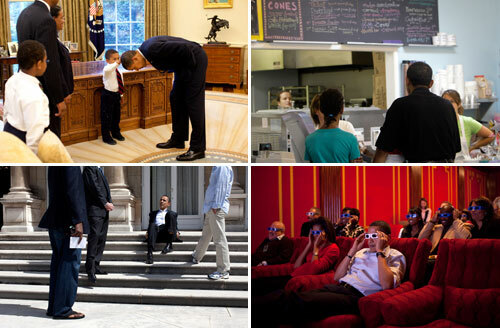 The official Whitehouse Flickr photostream is pretty impressive too. [UPDATE] Not to be outdone, as of yesterday, National’s photostream features Kate Wilkinson with a giant lump of earwax block of cheese. Great links AYB. Allow me to boost the marvelous BAGnewsNotes, which, as well as being a hub for links to lots of other great photojournalism resources, has a couple of kickass photographers of its own. Hnuhhh huhh huh that says “cones”. I think PhilU just found a new hero. Well Kate Wilkinson might be holding earwax, but at least she ain’t eating it. Standing in the Dock flanked by a Police officer. There is a New Zealand one Doug. If you look closely you’ll see Kate Wilkinson sitting in a bunker in an undisclosed location, eating your promised tax cut. At least that round of Cheese is made by an award winning Cheese Maker. Crosby/Textor should win a Cheese Maker award if you ask me.